Recalling some lovely works of English composer Thomas Tomkins (1572-1656), your male voice group if you have one should probably grasp with all hands and voices his motet O Lord how manifold are thy works setting for TTBB, from Musica Deo sacra (London, 1668). And I must mention the gorgeous Russian Orthodox sounds of Blagoslovi, dushe moya, Gospodi from the wonderful Vsenoshchnoe bdenie (All-Night Vigil, Op. 37) by Sergei Rachmaninoff. This will be a good opportunity for singers to become more familiar and enjoy singing tones, that text with the mysterious dot three syllables from the end of each phrase or line (see also Notes for Singers). These chords (I-vi-iii | I-iv-V-I) are not as ‘colourful’ as one could wish — read modern, jazz-influenced harmonic structures such as Δ or 9th, 13th or tri-tone sub. (4) However, that avoids a whiff of anachronism I guess; and singers, as always, will enjoy stretching into the four-part journey of ‘psalms in tones’. 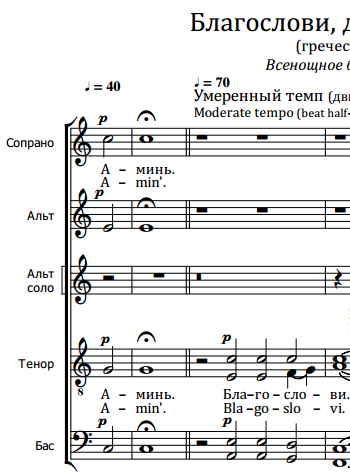 Note consecutive fifths in the bass line. These were traditionally regarded in composition theory as quite bad form. Sounds great here. Texts in TiS is not always inclusive; and frequently the verse selections do not match the RCL. On this occasion, however, it’s close enough. Our male voice group will not sing the programmed Schubert for TTBB due to absences this Sunday — with blessings and a cheerful wave, of course, as family and travel commitments are important. Chords are abbreviated to a Roman numeral indicating the degree in the scale of the root note (I = doh). Upper and lower case numerals indicate respectively major and minor triads.